Friday night (Oct. 27) 2 Chainz and Travis Scott made a joint appearance on The Tonight Show Starring Jimmy Fallon, with the two performing their collaborative track, "4 AM." For their televised performance of the song, which appears on 2 Chainz' latest album, Pretty Girls Like Trap Music, the two rappers decided to get a little spooky given the upcoming Halloween holiday, with their set decorated to fit the theme complete with backup dancers sporting ghastly face paint. 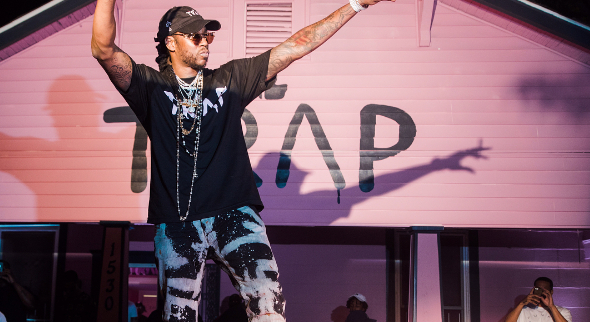 2 Chainz, who is still recovering from a leg injury, performed from his now-trademark pink wheelchair, with adrenaline from the performance helping him jump out of it partway through the song despite possibly being in some pain. During the Atlanta rapper's formal sit-down with host Jimmy Fallon, he talks about how he's not allowing his recent injury to hold him back, his sidekick pup Trappy (who adorably falls asleep mid-interview) and his GQ series, The Most Expensive S—t. Needless to say, this was an episode not to miss. Take a look at some clips below.